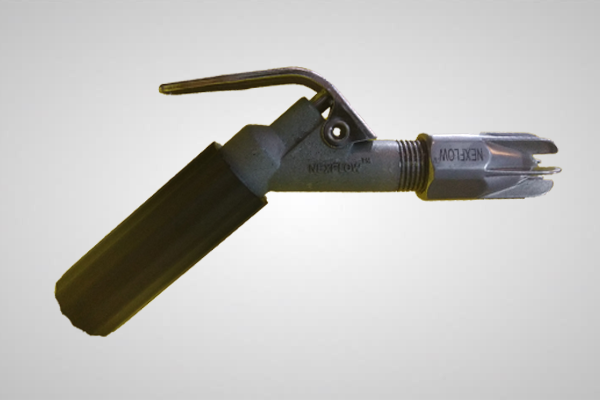 Nex Flow “Heavy Duty” Safety Air Gun with ½” air nozzle connected to the ½” air gun outlet, in either cast zinc or stainless steel is extremely powerful but safe, for those applications where traditional air guns are just not enough in rugged industrial environments. Most heavy duty guns are only up to 3/8” outlets and cannot compare to the power of the Nex Flow X-Stream Heavy Duty Safety Air Gun. Powerful flows and force are produced with this comfortable ergonometric design, and durable cast zinc body with composite rubber grip and tailored handle to provide optimal grip. The force provided is 5 to 7 times more than traditional air guns. Aluminum extensions are available to be added to these units to reach into hard to get areas.